Finding funny alien music downloads can be more substantially more challenging than finding other, more mainstream music downloads. This only makes sense, of course, because by not being mainstream, there will be far fewer services and websites dedicated to that style of music. Before we get started looking for where you can find these unique tunes and songs, it might be a good idea to clarify exactly what we are looking for in the first place. 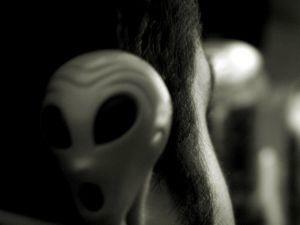 Although the name of genre may lead you to think that we're talking about melodies created by or for little green men hanging out at Area 51, alien music is actually its own special genre that really has nothing to do directly with Martians or other out-of-this-world musicians. Instead, this genre of music is based on the principle that music does not have to follow a standard pattern of 12 notes per octave. If you look into Indian music for example, they expand what is possible within each note and each octave. Alien music takes this one step further by removing the set number of notes and octaves all together. what results is a much more free expression of a particular mood or feeling. Typically, alien music is played quickly so that listeners do not have time to focus on the individual notes, sending their attention rather to the overall impression and mood that the music sets. Two artists that pioneered the style are Victor Wooten and Jaco Pastorius. So, what happens when you take the expressionism found in alien music and add in a hint of comedy? Should we be expecting the hilarity found through the parodies of Weird Al Yankovic? Well, yes, to a certain extent. Also bear in the mind that the feeling provoked by some funny alien music downloads is simply a sense of joy and laughter. In this way, it is still adhering to the original concept of alien music: designed to evoke a mood or feeling, while eschewing the conventional framework of notes and octaves. This style of music is fairly obscure, so it can be challenging to find reliable and high-quality sources to get your hands on funny alien music downloads. Here is a handful that we at LoveToKnow managed to dig up. Remember, we encourage you to download legal music, whether they are free downloads or not. Alien Music Club: The website is a little on the amateur side, but it's great to see that they update it regularly with all sorts of new information and downloads. They talk of "lots of new tunes in the cooker", for example. It is also helpful that Alien Music Club provides "an eclectic blend of alternative music in diverse musical genres ranging from all forms of rock to jazz to funk to anything in between with intelligent lyrics and a playful sense of humor." Be sure to check out their music, videos, and bio. Rhapsody: One of the most popular online music download services out there, Rhapsody carries the above mentioned Alien Music Club. Treat yourself to the free previews before choosing to purchase any given song by the group. They're all wildly imaginative and pretty darn funny too. Victor Wooten dot Com: As mentioned earlier in this article, this man is one of the innovators of the alien music genre and as such, his official website is definitely a good starting point. Jaco Pastorius: Much like Victor, Jaco is also a fantastic artist with some music. Some have said that he is the best bass artist to ever grace a studio or a stage, and you really have to listen to truly appreciate his genius. Several videos of his live performances are also available on websites like YouTube.